A group of hardware enthusiasts with Gigabyte recently demonstrated the potential of Intel’s X299 platform as it relates to overclocking. 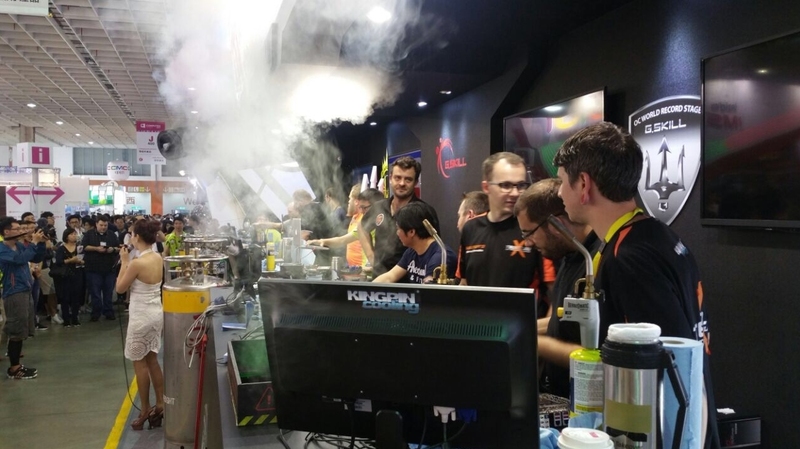 At Computex, Gigabyte hosted an X299 OC gathering that brought together nearly half a dozen of the world’s top enthusiasts including the company’s own senior overclocker, HiCookie. Utilizing liquid helium at -250° Celsius, the team was able to push Intel’s Core i7-7740K CPU to 7,500MHz (multiplier of 75 and a bus speed of 100MHz) on a Gigabyte X299-SOC Champion motherboard. A 16GB kit of Corsair Vengeance LPX 4,333MHz memory was also used, as was a Corsair AX 1500i power supply. The same CPU (albeit clocked a little lower), board and PSU combo was also used with an AORUS GeForce GTX 1080 Ti Xtreme Edition 11G graphics card and G.Skill Trident-Z 3600C17 RAM to set new world records in 3DMark03, 3DMark06 and Aquamark benchmarks. With a second 1080 Ti, the group was also able to reach the global first place position in 3DMark06 with a score of 71,176. While this type of extreme overclocking is largely for bragging rights and doesn’t imply that you’ll achieve similar results, it’s interesting to see just how far modern silicon can be pushed in the hands of experts with non-practical cooling techniques. Overclocking at such a high level is an art form, really.